Hubpages Article: Are Robots Becoming More Human? We have a new article out at Hubpages that examines the question of whether or not we can consider advancements made in robotics and artificial intelligence to be giving us products that approach anything close to “humanness.” We have taught robots to perform some amazingly self-reliant tasks in learning and self-teaching, but does this really make them anymore human? What about the brain makes it such a difficult network to replicate? This is the second article in our series on the positives and negatives of automation. As a manufacturer of automation machinery, we feel that it is our responsibility to be forthright about the controversies and questions that are a part of the industry. We provide these articles in an attempt to have a more informed customer and partner base, and in so doing, we hope to encourage a healthy dialogue on many of these topics. Rachel Greenberg writes marketing and technical content for Automation GT. Have people always worried about technology? At least since the Industrial Revolution, there have been people with technophobia, the fear of technology. As new technology has taken an increasingly large role in the workplace as well as in the home, it can be very easy for people to become overwhelmed by the adjustments, and in some cases to even feel threatened. In England, destruction of factory machinery had become such a problem that by 1727 it was considered a capital offense. Later, in the early 19th century, English weavers vandalized and destroyed automated looms in protest of job loss. This group, called the Luddites, had such a cultural impact on the subject of automation that their name is still used today to refer to people who oppose or resist technology, especially in the workplace. Depending on the type of technology, different technophobes will have different reservations. In some industries, fear of using technology or working with technology has been such a problem that employers have had to offer classes on coping with and understanding technology. In the case of automation, the most common fear, whether founded or not, is that automation is meant to replace people. In truth, we have seen no long-term evidence that there has been any massive change in employment as a result of factory automation. Certainly, automation decreases the likelihood that people will perform a certain set of jobs, but at least according to the compensation theory, automation really just shifts the set of jobs that are open to people, but does not do anything to decrease employment rates. In fact, until the dramatic job loss in 2000 employment rates in America improved as American wealth grew. Further, there is little evidence to suggest that automation had any bearing on job loss in 2000. In fact, as Stephen Ezell at The Innovation Files argues, American manufacturing has actually slowed in the last decade, and had manufacturing grown at a more robust rate, there could have been as many as 8 million jobs created as a result. Today, most machine automation is still in factories, and as we discussed in our first article, the need for automation in these jobs is evident, but when combined with a poor economy and uneven wealth distribution, it can cause serious social problems. However, as we get better and better at developing machines and software, we continue to find new ways that we can apply automation systems, and new tasks that can be automated. And this seems to be the root of what really causes alarm: the seemingly endless list of jobs that can be automated, and the degree of success that we have with totally automated systems. For those already experiencing some technophobia, this inability to ever assume that there will be no more change in automation levels is unsettling. No matter how much we resist the idea that certain things cannot be automated, the truth is that automation is constantly creeping into the territory of “knowledge work” and creativity-based jobs. This means that, while the compensation theory says that workers displaced by automation should be able to move into more senior positions that require more training (for example, a displaced factory line worker gets a job operating the machine that replaced him or her), the reality is that as we continue to rely on automation, the higher up the ladder automation goes. 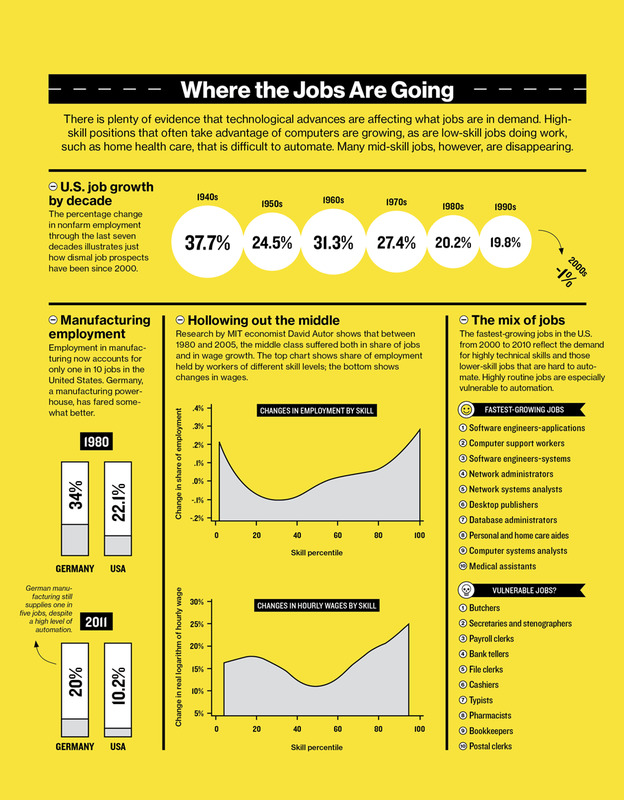 Estimates on job automation range from 47% to 80% of all positions within the next twenty to thirty years. However, the further up the chain of command you go, the fewer positions there are that would be available to most workers. Indeed, while opinions are mixed on what the increasingly large American income disparity means for employment and our economic culture, the truth is that in the last twenty years, 100% of wealth increase went to the top 20% of households while the lower 80% actually saw a decrease in wealth. This reinforces the idea that we are only really interested in investing heavily in the smallest percentage of jobs, those few at the very top. And as some critics point out, in many cases there are simply not enough upper level jobs for everyone, nor would everyone be well-suited to these jobs. Because the most in-demand positions in America right now include software engineers, computer support workers, and computer systems analysts, many who support automation suggest that those getting displaced should be encouraged to seek out high-tech job training. For those who are just not capable of doing that kind of work, or have no interest in it, other high-demand jobs include personal and home care aides and medical assistants. Yet at the same time, these jobs are often listed among those that are candidates for automation. Part 1: Why automate in the first place? Part 2: Who’s afraid of a little automation? Part 3: How far up the ladder can automation go? Part 4: How do we keep people employed? Or shouldn’t we? Part 6: How can we automate responsibly? This week, we partnered with Cerasis to publish an article on five of the financial factors that are encouraging a reshoring movement in the US, as well as five alternative ideas to keep in mind. Very broadly, the article covers rising wages in China, affordable options in automation in the US, the effects of environmental regulation and affordable available energy, manufacturer concern on the lack of intellectual property right enforcement in China, and changing consumer and manufacturer opinions on the importance of reshoring. Go to Cerasis to read the full article, and check back here regularly to see where we have posted new articles each week!